I wanted to get this notice we received from the National Association of Realtors out to all our blog friends. This is the information and examples about the new 3.8% tax and how it affects real estate sales. This tax is a part of the Obama Healthcare Bill. It will be interesting to see if and what the Supreme Court upholds. They say it is not a Real Estate Tax, because it does not remove the $250k and $500k deductions on the profit from the sale of your home, but applies to the profits after those deductions are taken and applies only to individuals over a certain income. It will apply to certain other incomes and capital gains. I suggest you discuss it with your accountant or tax advisor. The National Association, the Arizona Association and the local Realtors are opposed to this tax, but our disapproval went unheeded. We want to take a moment to share some exciting news with you regarding our real estate business. Our brokerage, John Hall & Associates, has been acquired by one of the largest real estate agencies in the southwest; Realty ONE Group. Realty ONE Group has experienced exceptional growth with their state-of-the-art technology and professional office facilities. They have retained the exceptional leadership from John Hall & Associates; combining innovation with experience! Thank you for your patience and understanding of this change. We think it is a really good one. John Hall & Associates has a reputation since 1974 for outstanding service, integrity and professionalism. Realty ONE brings us the technology to maintain our standing in today’s high tech world. If you have any questions about this change, please contact us! Risks to living in a 55+ community are not as has been recently reported, the risk is not having a surviving spouse less than 55 years old having to sell, but grandchildren! The surviving spouse if under 55 is covered by the HUD regulation of 80/20. Only 80% of the residents need be 55 or more. The remaining 20% is designed to cover the heirs. That 80% is carefully monitored and checked every 2 years. To drop under that 80% is a fearful thing in these communities and puts them at risk for losing their Fair Housing exemption and turning overnight into a multigenerational community. 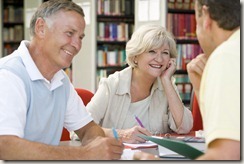 The true risk in purchasing a home in a 55+ community is grandchildren! Two scenarios create the risk. The first is today’s economy and high unemployment rate. Adult children are moving home to Mom and Dad and bringing the grandchildren with them. The fine print in the 55+ communities HOA’s is that NO ONE under 18 years old can reside for more than a limited number of days. So Mom and Dad may have to move out of their 55+ resort community and into a multigenerational one! The second risk factor is again Grandchildren. Adult children move out of state for one reason or another and take those grandchildren with them. Grandma & Grandpa do not want them to be so far away and choose to leave their 55+ lifestyle and follow the grandchildren. I love our gardens. Love being a member, even if I don’t get there as often as I would like. 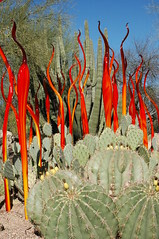 Last year the Desert Botanical Gardens had the Dale Chihuly: Nature of Glass exhibition. Because of the exhibit, the gardens increased their revenue last year by 45%. With so many of the museums, parks and other community facilities facing closure due to the economy and lack of funds, I am glad The Desert Botanical Gardens is doing so well. The numbers are starting to look a bit more encouraging. After months and months of sales prices falling the home sales prices seem to have stabilized. For the past 10 months the average home sales price has bounced between $170,000 and $180,000. Up a bit one month, then down a bit the next, I think is an indication of multi-million dollar home sales added into the mix. As you can see from the Arizona Multiple Listing Service chart, the prices dipped as low as $159,000 and are seeming to hold steady. This is a broad picture, looking at all of Maricopa County. Things may be different neighborhood to neighborhood and community to community. Depending on the number of foreclosures, short sales and total sales, the outlook can be different for the area you are considering purchasing a home. It is time for a talk about Air Conditioners and what you need to know! It is time to think about your air conditioner, and not because summer is around the corner. There are new laws governing air conditioners. Freon systems (R22) can no longer be installed. This is due to the Clean Air Act of 1990. As of January 1, 2010 air conditioning systems that use Freon (R22) are no longer allowed to be manufactured. All new systems must be Puron (410A). The challenge is the two cooling chemicals don’t work together. They are like oil and water; like putting regular gas in a diesel vehicle. It just won’t work. So if your compressor goes bad, you could have to replace the compressor and air handler! And that is a huge cost. What does this mean to you? Well I had a chat with Tara Carter from Old Republic Home Protection and learned a few things. She said that there is no specific time frame for parts to be available. Depending on your AC unit, and what needs to be replaced on your unit, there could be a shortage of parts, starting right now. Parts could be found out of state, and across the country. So understand that repair times could be longer than desired. If a part is not available anywhere in the country, you will have to have the whole unit replaced. That could be a cost of 6 or 8 grand and up. That is why if there was ever a good reason to have a home warranty, it would be now. A few things to check before you choose a Home Warranty company make sure they will cover the full replacement of your AC both the air handler and the compressor. (like Old Republic) If one or the other goes, both will have to be replaced. If you have a newer unit, you may not need to worry. Be sure to get your unit serviced annually and keep it in good working order for as long as possible. Why isn’t the bank doing a short sale? I had a great question asked this week. The person asked me about a house in their neighborhood. It had been vacant for a while and they were interested in the stats and possibly purchasing it. I looked up the house and found out the property was scheduled for foreclosure in less than a month. The consideration for a short sale is requested by the owner of the home. It may be in the owner’s best interest to do a Bankruptcy, and let the property foreclose. If the owners had consulted with a tax attorney, they may have been advised to move forward in the manner they were. Doing a short sale is not the choice of the bank. They (the bank) cannot opt to sell the property, as they do not own it. The current owner could at the last minute pay the bank the fees owed, renegotiate their loan and get out of default. The foreclosure process allows the owner to get out of trouble if they can. The bank is not at liberty to do anything until they have ownership of the property.